I was at the Chef conference the other day and while talking to a Sys Admin who would now prefer being addressed to as a DevOps person now, was ranting how they wanted to move away from the expensive VMware and implement OpenStack! There are several who have these smart plans but looking at the complexity involved in trying to understand why this is impossible, makes me to accept this ignorance. Firstly OpenStack is very close to me as it's written in Python :) Python continues to be the secret ingredient for success of things as ancient as Google, upto DropBox and now for "The Linux of the Cloud--OpenStack!" Before we start off lets understand what a Hypervisor is! Why doesn't the wiki page for Hypervisor not even mention about OpenStack? OpenStack, a cloud-computing project, aims to provide the "ubiquitous open source cloud computing platform for public and private clouds." Predominantly acting as an infrastructure as a service (IaaS) platform, it is free and open-source software released under the terms of the Apache License. The project is managed by the OpenStack Foundation, a non-profit corporate entity established in September 2012 to promote OpenStack software and its community. So saying you don't need VMWare or the like and will go along with OpenStack is like saying, "I will throw out the server/hardware as I would like to go ahead with OpenStack"! With OpenStack you would still need the hypervisor which will take care of managing your baremetal, while OpenStack Taking care of helping you build Infrastructure as Service. 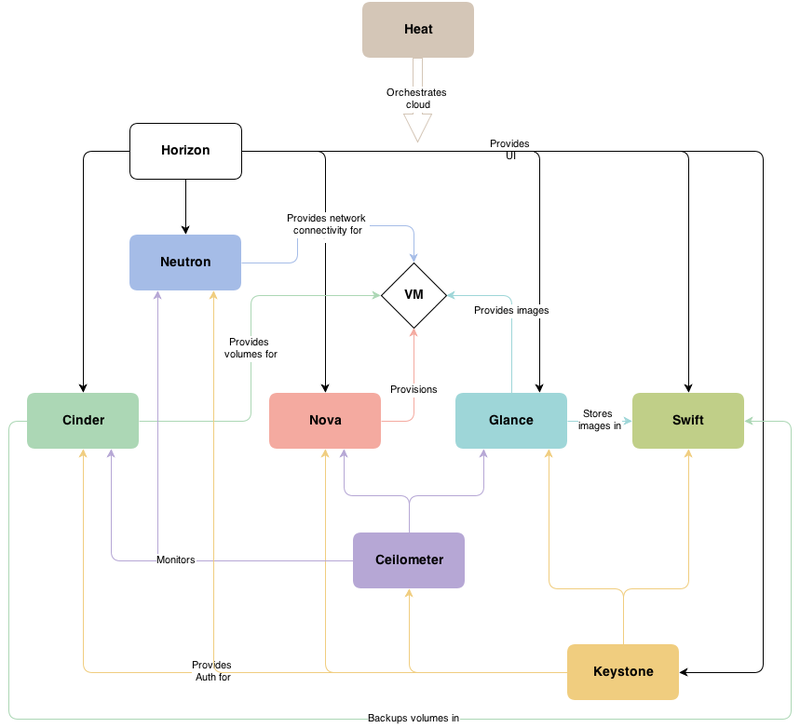 OpenStack Compute supports many hypervisors to various degrees, including KVM, LXC, QEMU, UML, VMWare ESX/ESXi, Xen, PowerVM, Hyper-V.
OpenStack is not the product! As mentioned above its the name of the non-profit organisation. OpenStack is a great philosophy which is in progress and is not yet there, but The long term vision is to produce a ubiquitous open source cloud computing platform that will meet the needs of public and private cloud providers while being highly scalable or elastic. 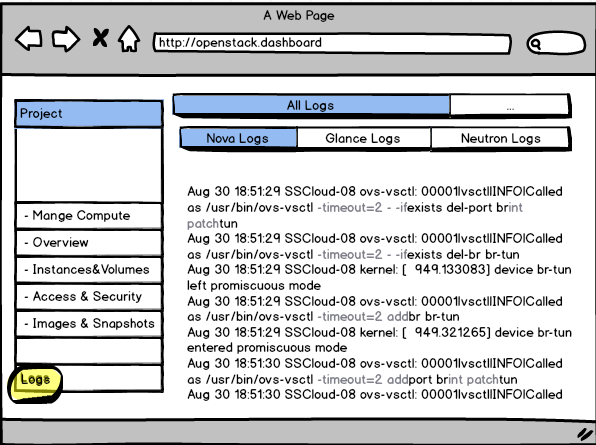 OpenStack services control large pools of compute, storage, and networking resources throughout a data center. Each service provides a REST API so that all these resources can be managed through a dashboard that gives administrators control while empowering users to provision resources through a web interface, through a command-line client, or through software development kits that support the API. 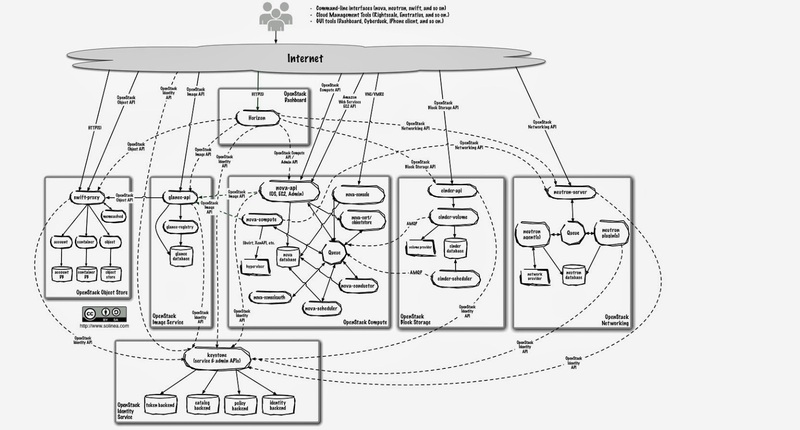 Below is a conceptual architectural diagram of the same. And it could even get as complex as this, but when we start to understand which we will in the coming days, we are bound to have several aha moments! -L if server reports that the requested page has moved to a different location. redo the requests on new place. -O Write output to a local file named like the remote file we get. The remote file name to use for saving is stracted from teh given URL. wget is more like a predecessor of curl.